Older teen and adult patients who wish to avoid traditional brackets and wires often qualify for clear, cosmetic aligners. Provided by Invisalign®, clear aligners are designed to fit comfortably and discreetly over your teeth, gently and gradually guiding misaligned teeth into straighter positions. The aligners can be temporarily removed for better, more efficient hygiene, and to allow you to eat your favorite foods without getting anything stuck in your braces. For patients who want a more discreet orthodontic solution, Dr. Davies provides ceramic (clear) braces. The high-quality ceramic blends in naturally with your tooth structure for a more esthetically appealing result. While ceramic braces are more discreet, they function the same way as traditional metal braces. Traditional metal braces are the most common orthodontic treatment option, and consist of small brackets that are bonded to the surfaces of your teeth. An arch wire passes through the brackets and provides a gentle but continuous supply of pressure to gradually shift your teeth. You may also choose colored bands to customize your braces. Though technically not braces, palatal expanders are a common and effective orthodontic treatment. Expanders can be placed in the upper palate to expand the maxilla (upper jaw), making room for your child’s teeth to grow in properly. Expanders are typically recommended in patients with crossbites, or when crowding issues create complications for teeth that have not yet erupted. When children exhibit malocclusion (tooth and/or jaw misalignment) early in life, the future of their oral health can depend on early orthodontic treatment. Often referred to as two-phase orthodontics, the treatment combines the benefits of straightening crooked teeth and correcting jaw and facial structures. After comprehensive examination, including a CBCT Scan and imaging, Dr. Davies may recommend two-phase orthodontics to help your child avoid the need for more extensive correction later in life. 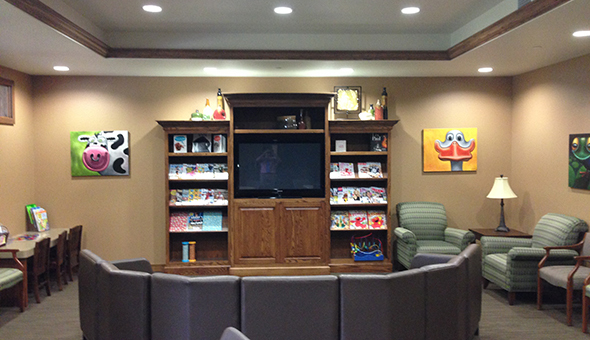 The first phase of two-phase orthodontics focuses on helping children maintain proper growth and development. Early orthodontic correction helps ensure that children don’t suffer from crowding or spacing issues that could interfere with the development of their primary teeth, or the growth and eruption of their permanent teeth. Successful early orthodontics can help them avoid the need for more extensive orthodontic correction, dental restoration, tooth extraction, and possibly oral surgery due to subsequent complications. Once all of your child’s permanent teeth have erupted, Dr. Davies can evaluate for a second phase of orthodontic treatment. This phase typically includes traditional braces to ensure that every tooth is properly aligned and in its proper place as the jaw continues to develop. After the completion of phase two, your child will wear a night time retainer to ensure the treatment’s success. Orthodontic-related emergencies are rare when you properly care for and maintain your braces. When an emergency does occur, Dr. Davies and our team are there to help minimize discomfort as soon as possible. Issues such as unusual soreness, loose brackets or wires, and more should be addressed promptly so you can continue your orthodontic treatment without complication. If you need to reach Dr. Davies after hours, you may do so at (262) 227-5160. With a variety of braces and orthodontic options, we can customize a treatment plan that meets and exceeds your expectations! To find out what type of braces are right for you, call Davies Orthodontics at (262) 542-9151. With offices conveniently located in Waukesha and Oconomowoc, WI, we proudly serve families throughout all of our surrounding communities.